John 11:35 is the shortest verse in the Bible, but some feel it is one of the most powerful. Lazarus had died, and Jesus spent time with Lazarus’ sisters seeing them through their grief. Jesus hadn’t hurried to Bethany or spoken a command to prevent Lazarus’ death, but at the point of His weeping, He knew He’d be raising Lazarus from the dead. So why did He weep? There are a lot of wonderful commentaries on the subject of why Jesus wept. For insightful, doctrinal reasons, I’d refer you one of my favorite writings on the subject via Jon Bloom’s perspective from John Piper’s ministry and the Desiring God blog and website. For me, I find great comfort in knowing that Jesus wept and grieved with Mary and Martha over his dear friend Lazarus. He showed His full humanity in connection with exercising His full deity in raising Lazarus from the dead. In showing His humanity, He grieved. Does He grieve when I weep? Does He grieve when a parent mourns the death of their child? Does He grieve when villages are wiped out from disease or atrocities? Does He grieve when a child is abused and forever changed? Does He grieve when a husband makes the choice to abandon his marital vows? Does He grieve when a wife is caught up in the compliments of another man? Does He grieve when families fall apart from not seeking His path? Does He grieve when we grieve?? Yes. He grieves for us as His children. He grieves for a fallen world. In regards to Lazarus: Knowing all He knew, knowing all He was capable of doing in the situation, and still knowing what He would do afterward, our amazing God and Lord wept. In regards to us: Knowing all He knows, knowing all He is capable of doing in our situation, and still knowing how―with our obedience, love and cooperation―He plans to work our hurts and our weeping for good, we can know He weeps with us, too. He weeps with us about what we have done, about what has been done to us, and about what has been done in this world. Through my own trials and challenges, I know He has wept with me as He’s held me in His strength to walk me through my anguish. I know He has wept as He has comforted me in His loving arms. Jesus wept. 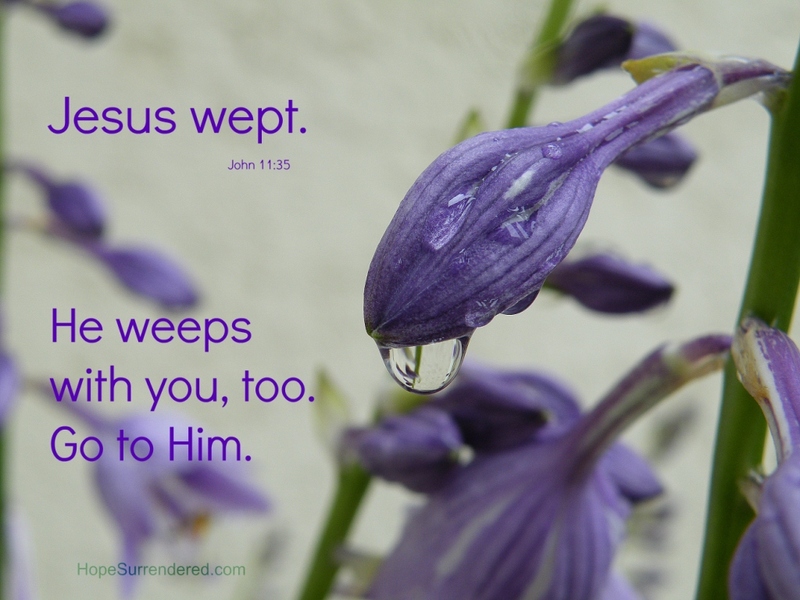 He weeps with you, too. Go to Him.